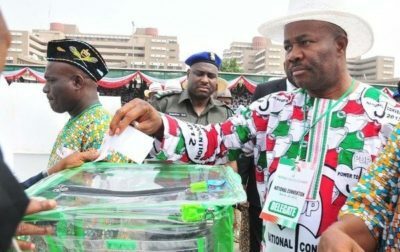 Akwa Ibom Poll: PDP Ward Officials’ Shocking Discovery Over Senator Akpabio’s Result | Welcome to Dare Lasisi's blog! Our in-depth investigation in broader perspectives across Ikot Ekpene Senatorial District reveals that Senator God’s will Akpabio was widely voted for by many card-carrying members of the People’s Democratic Party PDP. In a secret Vox Pop surveillance operation carried out by our team of investigative journalists across Abak, Etimekpo, Ika, Oruk Anam Ukanafun, Essien Udim, Ikot Ekpene and Obot Akara , a good number of PDP faithfuls confessed that even though they collected some financial inducement from governor Emmanuel and PDP, but they voted for Senator Akpabio in the 23rd March Senatorial elections because of his remarkable developments and good empowerment programs across the senatorial district. We never in our human imagination comprehended that the man we filed as a candidate could muster half of the Senatorial votes. Because Ekpenyong is not known to helping people like Akpabio. Akpabio did not fail election in Annang land but in INEC office, they added. Their conscience will not allow them to sleep. This is because they have murdered sleep. Until they come out to tell the whole world what they did and apologise they will never know peace.